Sanur is one of Bali’s biggest traditional villages but it’s also one of the most established tourist areas. 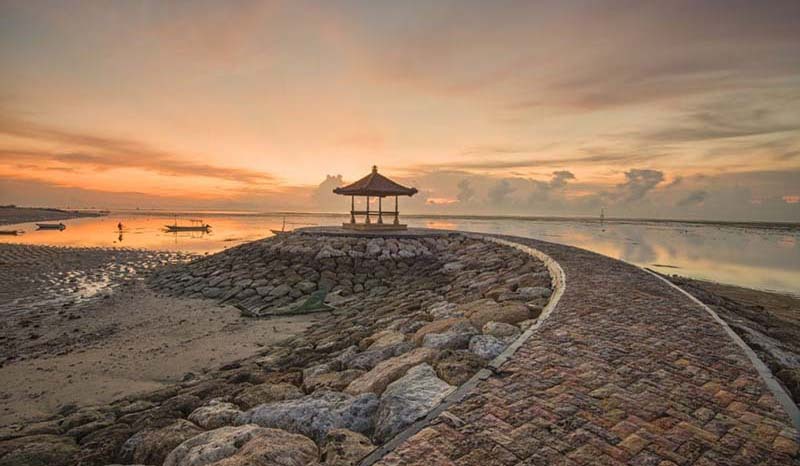 Sanur was Bali’s first beach resort but still retains its Balinese character and old style village ambiance.On the southeastern side of Bali, Sanur beach is easily reachable from Denpasar, about a 5 to 10 minute drive. Sanur is an excellent site to watch the sun rises, as we jog along the white sandy beach. The leafy main street Jalan Danau Tamblingan is lined with an eclectic mix of restaurants, shops and bars and an assortment of innovative and modern entertainment venues. Known for its laidback atmosphere, Sanur Beach maintains its wealth in arts and culture, making it an ideal destination to enjoy the best of both eras, classic and contemporary. Sanur Beach is the modern gateway to the surrounding islands – Nusa Lembongan, Nusa Penida, Lombok and the Gili islands. Many fast boats offer direct transfer from Bali to Nusa Lembongan, Most of the scheduled services leave from Sanur Beach Port at the end of Jalan Hangtuah and landing at Mushroom Beach port or Jungut Batu Port at Nusa Lembongan. The exact departure and arrival point on this beach depends on the tide. Other services run from Benoa Harbour, and there are local public boat services but recommended to use fast boats. We need about 30 minutes transfer from Sanur to Nusa Lembongan by Marlin Lembongan Cruiser.